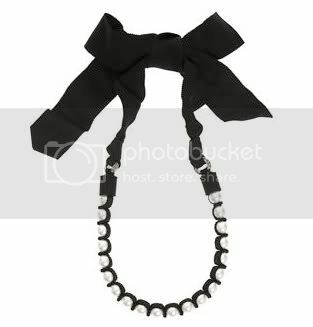 Barneys is selling this necklace, (and no those are not real pearls,) for $890. Seriously? 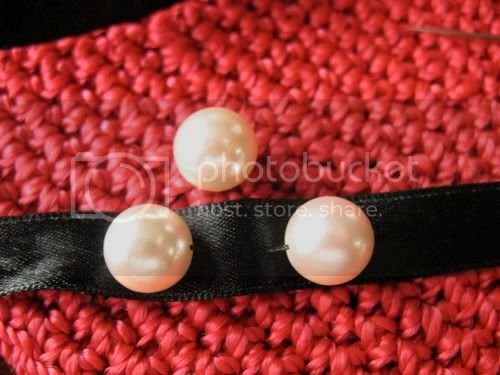 $890 for some ribbon and faux pearls? I made this bracelet in about 30 minutes using supplies I had lying around. I'm sure I could replicate the necklace completely with a trip to the craft store. I used some satin ribbon, a broken pearl necklace and thread. Next time I will use grosgrain ribbon and a strand of embroidery thread, as I think they would be better suited to the project. 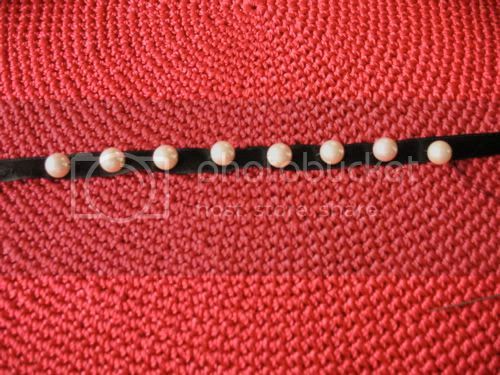 I started about 12 inches from the end of the ribbon sewing the pearls on with a basic running stitch, leaving a space the size of a pearl between each bead. 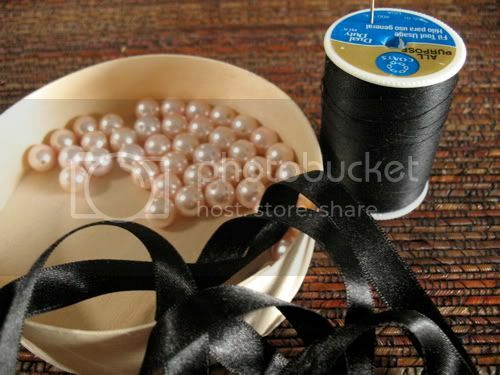 Once my pearls were on I started pulling the thread, just like you would if you were gathering fabric. Thats it. If I make these for gifts I will buy some jewelry findings and put a proper clasp on, but I did this on the fly, and it worked out pretty well. I found your site ages ago through a series of followed links and I've loved the crafts you posted. $890 seriously? That is insanity. Did you see my knock off Anthropologie necklace I did a couple of days ago. So fun to make something that looks expensive for nothing! Oh my I love it and will partake in tomorrow. Thanks for the tute! LOVE it! Such a fun bracelet that can be made even for a little girl to wear! I am gonna make some for my little girl and nieces!!!Thanks! Thanks for the tutorial...I have seen those necklaces and thought they were so cute...I totally have the stuff to whip one up too! And I think I shall! GET.OUT. Where have I been all my life? You're the best! Wow--those look just like one of my vendors jewelry. your version is awesome! not to mention $888 Cheaper!!! so pretty and what a clever idea. love ur blog. beautiful! Thanks so much for the tutorial! I'll try to do it! Thanks os much, great Tutorial and project! 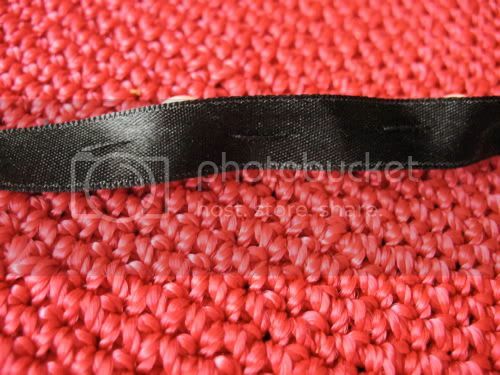 Wouldn't this be great trim for a cuff? Or with some home decor item? Check out my blog http://www.creativejewishmom.com for lots of crafty projects! Ooh that's beautiful! Thanks so much for sharing this, I'll be linking. I found your blog through One Pretty Thing and love it! I'll be linking this project through my blog at aliveradiantfree.com. Great post! Found you on One Pretty Thing. I bet you can make these for less than 1% the cost of Barneys' version! Gads the rich are so ridiculous!! very good idea, i am from Turkey and i found your link at a turkish craft website. can i try your version ? So wonderful! ^_^ I like it so much ... thank you fot the tutorial! Love them! I may make up a batch for the lovely ladies in the front office. What fun, and easy enough for me! so cute, and do-able-and i'll wear it! thanks for sharing. This is adorable! Thanks so much for the tutorial! Can't wait to make one!! Your post is awesome! Thanks for this tutorial :) I had been eyeing up the at Stella and Dot for awhile, but can't find it in me to spend the $44...the other one is sooo expensive! I can't believe you made yours - what an inspiration! I love the idea. The instructions are clear. Me and my 3 SIL's just made these together! Thanks for the great tutorial! I am featuring this on my site! Thank you for sharing all of these great projects. I just found your blog but I will be back again. Love the bracelet. I'm going to make this tomorrow. Just wondering, did you making any others with a clasp? I'm trying to figure out how to do that. Thanks! Oh I've made these bracelets before! They are so simple and yet so very elegant! WHAT?? 890 BUCK? I think not!! Good on you. I just discovered your blog buy hitting the "next blog" option at the top of my blog and have been blown away by your creations and inspirations!!! I could comment on every post but I think that's called stalking and you might report me for abuse hehe... So happy I found your blog!! 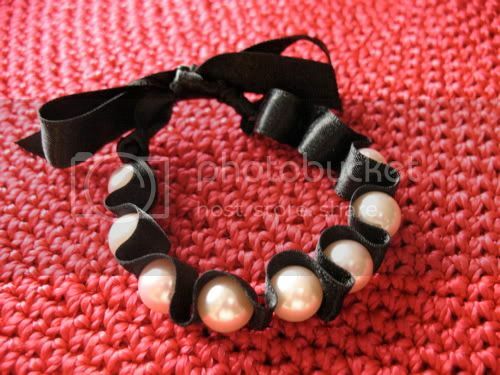 Love your pearl bracelet (found my way here from a site I visit regularly). 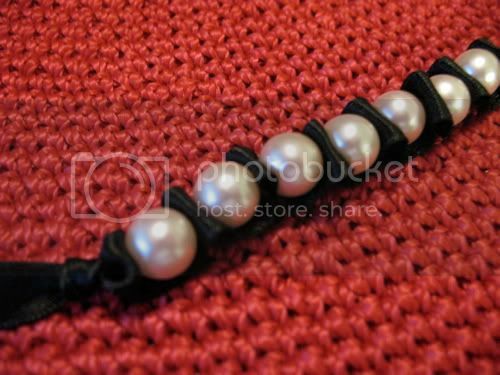 I've been thinking of makins some pearl bracelets and this might just be the way to do it. Thanks for sharing. I can't believe the Lanvin piece was so expensive! Your tutorial is just brilliant! I will link in an upcoming post. Oh I think thats absolutley divine You are so very clever and Im so glad I found your blog. Thanks for the inspiration. Great job! I really like this. I love this project! I love pearls and ribbons. It's the perfect combination! I am gong to add your site to my RSS feed. I'm so glad I stumbled across it. 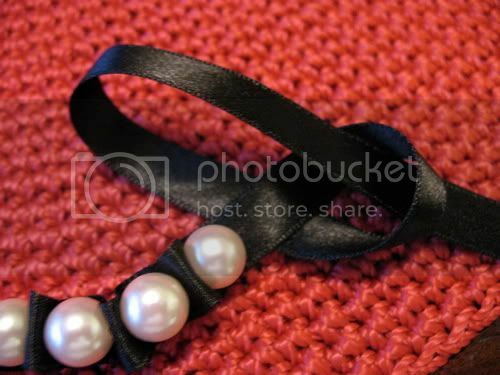 First of all, $890 for a piece of ribbon and faux pearls is completely insane! I would rather have my very own, uniquely handmade necklace and bracelet combo any day! Thanks for posting this! I love it! I think I will soon make one for myself! 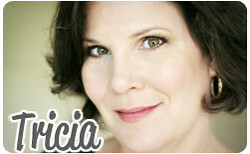 You are so awesome, Tricia! What a cute idea! I may have to make one too! So simple! This one's great! Thank you for sharing this idea. It's the perfect combination! What's with the $890 price tag? I think they meant to put a dot between the figure 8 and 9 to make it $8.90! Beautiful! I love pearls myself and recently found myself having to defend them as a must-have accessory for every woman! 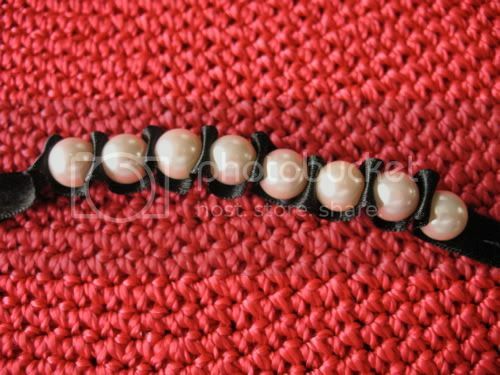 Hand made work for making such bracelets is creative work, Freshwater Pearls would be a good choice. I like your version a whole lot better then the one for $890! Hi there ! 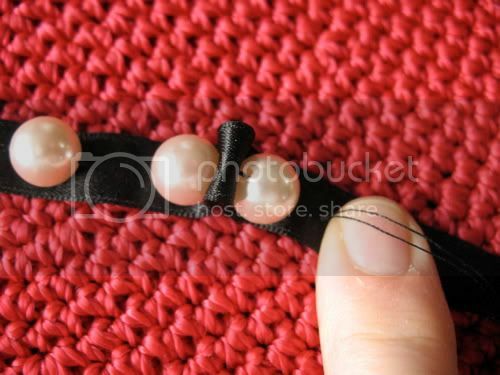 What a fab bracelet & super tutorial - your photographs are great ! I just wanted to let you know that I have featured this bracelet in my blog post today with a link back to you - hope you dont mind ?? Your really inspired. This kind of brace was awesome. I want to try this one. I bought last week Custom Silicone Wristbands for our organization for identification. I will introduce this bracelet as a fundraising proposal. Thank you. What I love about bracelets is that they look elegant and beautiful.